Algonquin Park's Wildlife Research Station (WRS), in cooperation with The Friends of Algonquin Park and Ontario Parks, will be hosting a ski event on Algonquin Park's Leaf Lake Ski Trail network, named one of Canada's top cross country ski trails. Join us on March 2, 2013 to classic or skate ski, learn about winter habitats of Algonquin wildlife, and enjoy a chili lunch. The events schedule is subject to updates, please check back in upcoming weeks. * You are welcome to ski longer, however lunch ends at 2:00 pm. All participants should be off the Leaf Lake Ski Trail before dark. The cost for this event is $10 per individual or $25 per family. 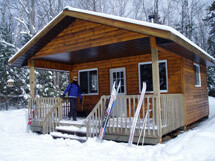 This cost includes the ski event, plus a chili lunch (meat or vegetarian option) at Dee's Cabin from 11:00am to 2:00pm. All participants must also have a valid Park Permit. Early bird registration is possible online until February 28, 2013 or you may register the day of the event (March 2, 2013) at the Leaf Lake Ski Trailhead from 8:30am to 9:50am. For more information contact the Wildlife Research Station.